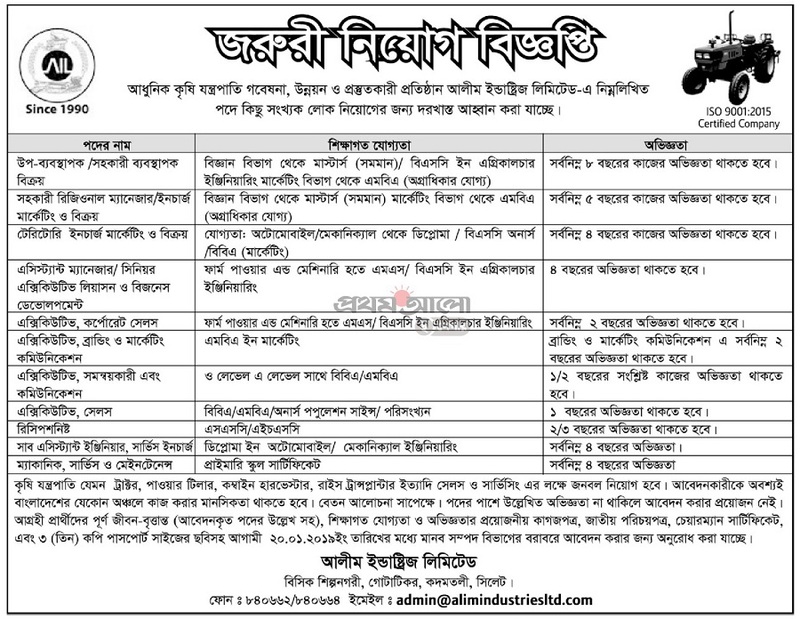 Alim Industries Limited Job Circular 2019 has been published by the authority in daily newspaper and to find in my website www.bdjobscareers.com. For your information, Alim Industries Ltd. was established in 1990 at the BISCIC Industrial Estate, Gutatikar, Sylhet. Late M. A. Alim Chowdhury was the mastermind behind establishment of the industry. Good News is that, recently the company looking new job holder of position of various positions. So, if you are interested in private organization jobs in Bangladesh we think the Alim Industries Limited Job Circular 2019 is good one for any job searchers. For your advantage, we have already given this job all of the necessary details such as educational qualification, application deadline, job circular image, published date, applying procedure and more. So let’s check and if you think you are right person for that job, please to submit your application. This entry was posted in All Jobs, Jobs Notice, Newspaper Jobs, Private Job, Prothom Alo Jobs, Sylhet, Today Job by Bappy. Bookmark the permalink.